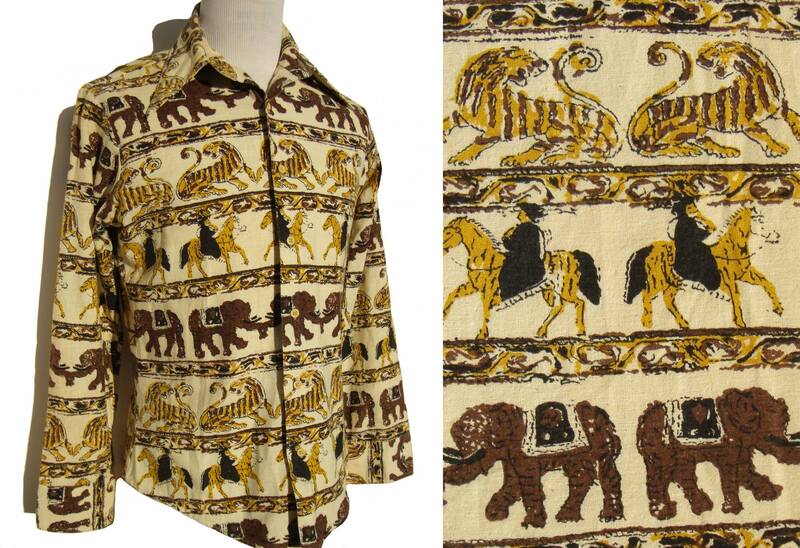 Fanciful elephants, majestic tigers, and cloaked figures on horseback, are featured on this vintage East Indian themed men’s shirt by Golden Vee , circa late 60s early 70s. The stylish novelty print shirt consists of a solid weight coarse weave linen type fabric with batik style animal print in colors of saffron yellow, cinnamon brown, and black over a cream colored ground. The shirt has long sleeves, pointed collar, button down placket, and single embroidered label for “Golden Vee”, “Tapered - 7” Drop” with logo, along with a size of M and 15 to 15&1/2, WPL numbers and a manufacturer’s overstamp on the label and inside collar.